Biblioteca del exilio (SPAIN) . This exile library, promoted by REDER (Red de Estudios y Difusi�n del Exilio Republicano) [Network for the study and diffusion of the Republican Exile], GEXEL (The Literary Exile Study Group) and the Miguel Cervantes Virtual Library, contains a specialized collection on the republican exile of 1939. The Historical Memory Docmentary Centre (SPAIN) . The Historical Memory Documentary Centre in the city of Salamanca safeguards a valuable collection that can be used by the citizens, directly, by consulting the original documents in the Centre building, or indirectly, by requesting the required information through the Centre's information service. The Centre is also entrusted with copying, conservation, description and promotion tasks, in order to guarantee the permanency of a part of the nation's documentary heritage and offer the citizens the enjoyment of assets that guarantee their rights and the knowledge of the most recent historical past. Open Memory, Coordinated Action of Argentine Human Rights Organizations, works to increase the level of social information and consciousness, regarding State terrorism and, to enrich democratic culture. One of our principle objectives is to gain access to all of the records from the last military dictatorship and so as make them and their consequences available for research and to educate future generations. Museo de la Memoria y los Derechos Humanos (CHILE) . The Museum of Memory and Human Rights Documentation Centre is orientated towards difusi�n and citizen access to the historical information contained in the collections of documents, textual archives, photographs, iconographs, recordings, audiovisuals and objects from the period 1973-1990. Grupo de Memoria Hist�rica de la comisi�n Nacional de Reparaci�n y Reconciliaci�n - CNRR (COLOMBIA) . Memoria Hist�rica (MH) Historical Memory, is a research group of the National Reparation and Reconciliation Commission (CNRR) that elaborates and circulates a narrative about the armed conflict in Colombia that identifies �the reasons for the emergence and evolution of illegal armed groups� (Law 975, 2005), as well as the distinct truths and memories of the violence, with a differential focus and opting preferentially for the voices of the victims that have been suppressed or silenced. Furthermore, the group formulates public policy proposals that favour the effective exercising of the rights to truth, justice, reparation and the guarantee that it will not be repeated. Biblioteca y archivo documental Voces de la Memoria (ARGENTINA) . The library and documentary archive Voices of Memory possesses an important collection of bibliographic heritage with more than 2000 volumes dedicated to the analysis and research of State Terrorism and Human Rights, not only relating to Argentina but also Latina America. Archivo de la Experiencia (SPAIN) . During the period 2007-2009, the Experience Archive has travelled Spain to gather the stories from people who wanted to share their memories. Their life stories and personal experiences are a legacy to be remembered. Centro de Memoria, Paz y Reconciliaci�n (COLOMBIA) . The Bicentenary Centre: memory, peace and reconciliation is a Project which aims to materialize the commitment to dignify the memory of the victims and promote a culture of peace and respect for human rights, by creating a setting for the teaching of and reflection on the past and present of our country. The Centre is made up of one physical centre (located in Parque de la Reconciliaci�n) and a virtual centre that will accomplish different objectives. Among them are, fund raising, compiling and presenting information such as testimonies, photo archives, videos, etc. as well as supporting and promoting the activities and initiatives of peace building, victims and social organizations. Ahaztuak 1936-1977 is an association that has worked since 2005 in the Basque Country and Navarra promoting the recognition of the victims produced by the military uprising against the Second Spanish Republic and the subsequent repression of the Franco regime. It maintains links with the State Federation of Forums for Memory , and has held many meetings to demand truth justice and reparation. Aranzadi. Sociedad de Ciencias . The Aranzadi Society of Sciences is a non profit scientific association whose objectives are research, exposition and protection of Cultural and Natural Heritage. Constituted as a Study and Research Centre, Aranzadi has become a place of reference among the scientific community, as was made evident recognition it received in 2001 as an Entity of Public Benefit. Asociaci�n para la recuperaci�n de la Memoria Hist�rica (ARMH) . This Webpage was designed to present the activities of the Association for the recovery of historic memory and allow for public access to the information related to the diverse contents and activities, as well as making it possible to gain access to other information, products, programs and services from different entities, such as those that become accessible through the existing �links� and connections. Asociaci�n 13 de Febrero de Dresden, Interessengemeinschaft 15. Februar 1945 . The association, "13 Februar 1945� is dedicated to the study of the bombing of Dresden during the Second World War. 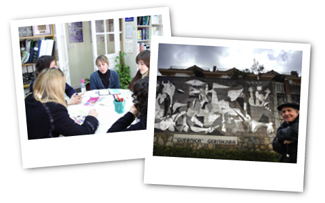 The objectives are: the recovery of historic and collective memory as a peace resource; create an archive and collaborate with the surviving people to promote research and develop different educational projects in the pedagogy of peace and memory field; the active incorporation of the elderly in the design of educational projects in order to transmit their life stories. The International Oral History Association (IOHA) . . The International Oral History Association was formally constituted in June 1996 at the IXth International Oral History Conference in G�teborg, Sweden. The Association provides a forum for oral historians around the world and a means for cooperation among those concerned with the documentation and interpretation of human experience. IOHA stimulates research that uses the techniques of oral history and promotes the development of standards and principles for the collection and preservation of oral histories. IOHA seeks to foster a better understanding of the democratic nature and value of oral history worldwide. Is a multilingual portal that is funded by the Foundation"Erinnerung, Verantwortung und Zukunft" ("Memory, responsibility and future"). The project centres on the study of nazism, the holocaust and the treatment it is given in the German education system. Intergenerational Dialogue. NIGEL Network . NIGEL is a European Network that develops intergenerational learning through the analysis and intercultural treatment of conflicts, peace education, narratives and historic memory, social and continuous learning, the environment and sustainability. Federaci�n estatal de foros por la memoria . The Forum for Memory is an organization that was born of a firm conviction to fight the losers being forgotten, for the defence of their dignity, with out seeking revenge, looking towards the future, seeking to incorporate, the vital essence and, the political and ethical principles that gave birth to the left, to present struggles. By localizing, signalling and excavating mass graves to return the mortal remains of the fallen to the families that want this; aid and recognise ex-prisoners, those who suffered reprisals, the exiled, ex-combatants, ex-guerrillas and their families, along with organizing informative events and tributes to all those who suffered as a result of the fascist uprising of July 18 1936. The Historian Group Gernikazarra formed in 1985 as the result of a few friends reflections. The Municipality of Gernika is well known for having lost its personal, written and graphic memory on 26 April 1937. Apart from the human loss, some 75% of the buildings were destroyed, and with them foral and municipal archives, from the courts, the land registry and many other such buildings. One of the principle objectives of Gernikazarra is to recover the town�s historic memory. The Documentation Centre on the Bombing of Gernika . The Documentation Centre on the Bombing of Gernika, part of the Gernika Peace Museum Foundation, was created following an initiative by the Gernika-Lumo Town Hall in 1997, which set out to draw up an inventory of all written, graphic and audiovisual material available worldwide (in libraries, archives, film libraries...) in relation to the bombing of Gernika on 26th April 1937, during the Spanish Civil War. Following years of research and collection of a large amount of interesting material, in 2003 it opened its doors to all potential researchers and those interested in learning more about the bombing of Gernika, the Civil War itself and the exile.The Documentation Centre is a public service which has a collection made up of books, documents, magazines and audiovisual material open to everyone interested in it.